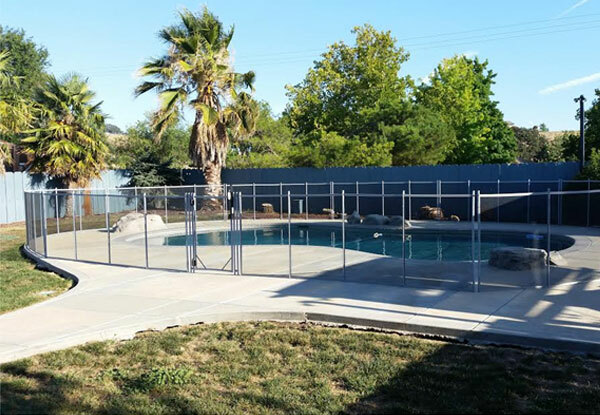 We installed his 4' tall removable “Pet Mesh” fence in Hanford, CA for a residential client. The removable fence circles the pool while leaving enough room inside to enjoy the pool deck. 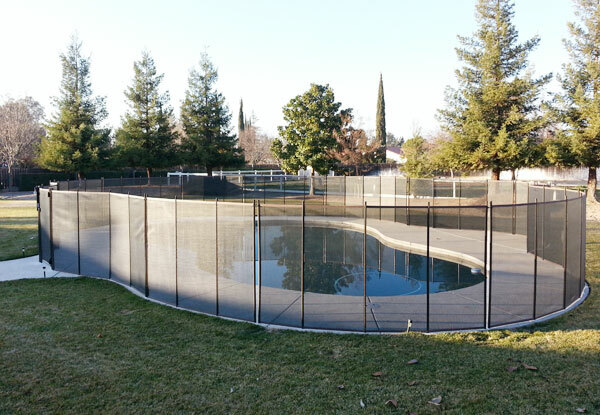 Guardian Pool Fencing installed this 5' tall removable fence in Madera County, CA. 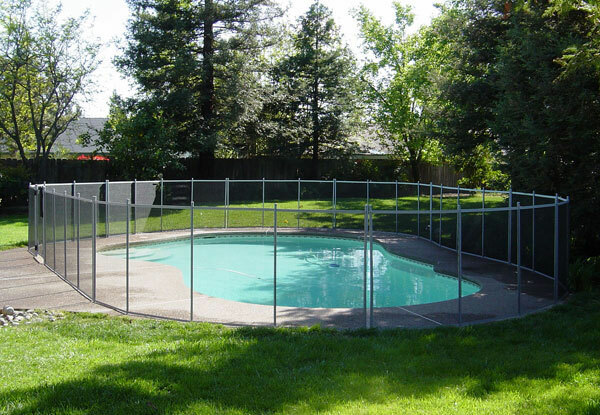 The removable fence features black mesh and brown trim and enclosed the lap pool to satisfy code requirements. Guardian Pool Fence built and installed this removable pool fence in Fresno, CA for a home that has a large pool and flowing waterway. To provide complete safety, we installed a removable fence that would block access to the pool area and the waterway. This 5' tall removable fence with black mesh and brown trim was mounted to a wood deck per Child Care regulations. Notice the woodwork at the end of the deck to ensure top line of fence was level with no gap between the fence and the dirt. 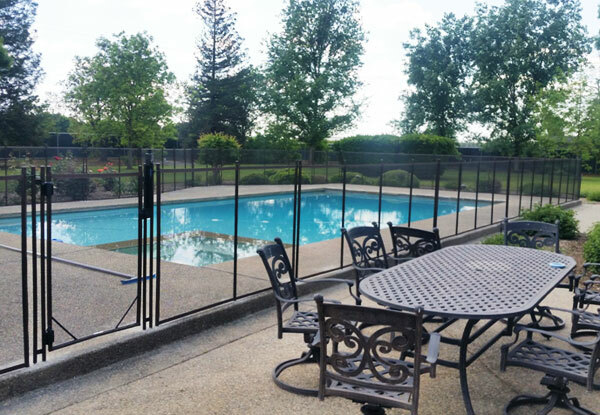 This removable pool fence in Fresno, California features our 4' All Black Mesh and extends from the back fence, around the pool and back to the back fence. We also installed 4 x 4's next to the chain link fence to ensure mounting integrity. Notice the quality installation around this home's angles and steps. 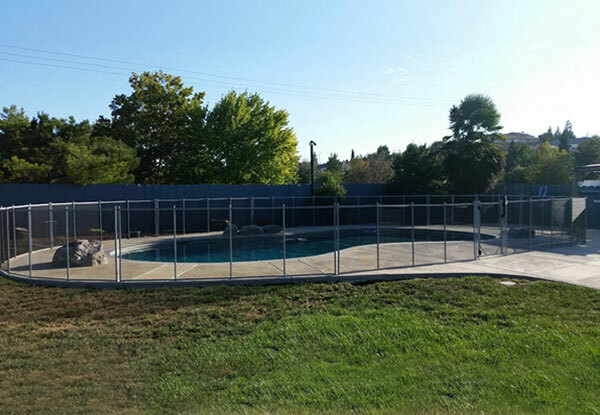 Our experienced staff completed this pool enclosure installation in Tulare, CA. It stands 4 ft. tall and was constructed using black mesh and beige support poles. This removable fence system encircles the client's entire pool, leaving the rest of the yard open for their grandchildren to play. 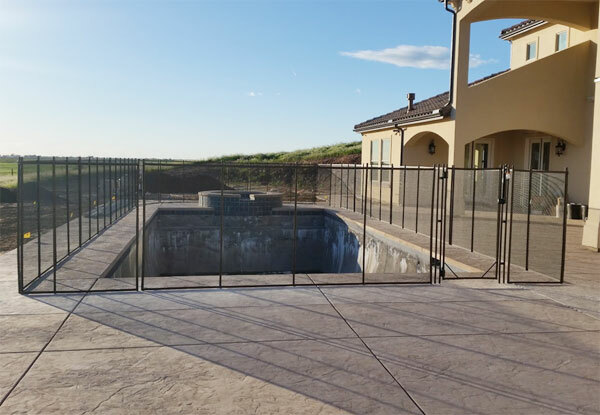 This 4' tall removable fence in Kingsburg, CA formed nearly a perfect rectangle completely isolating the pool, while leaving plenty of entertainment space on the outside. The fence features our black mesh with brown trim providing a safe barrier around the pool that also looks great in this backyard. 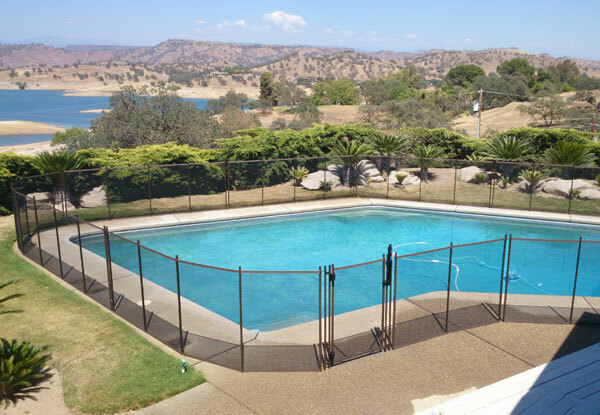 This 4' black mesh removable pool fence in Exeter, CA isolates this home's pool while leaving room on the outside for non pool activities. The fence features a brown trim and goes from the yard's side fence to the back fence to meet our customer's request. 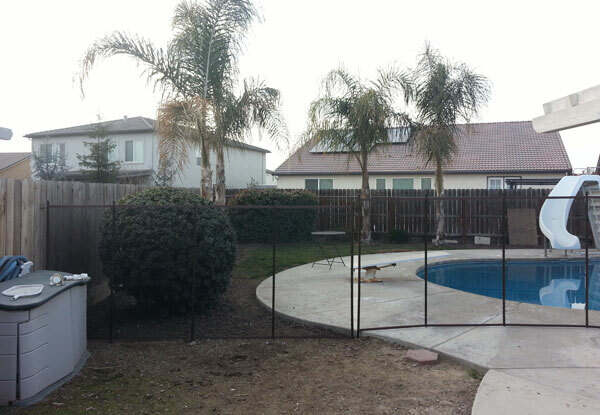 We designed and installed this 5' tall "pet mesh" removable fence in Tulare. By completely enclosing the pool, it provides a safe barrier for children and pets, and satisfies the city's building code requirements. 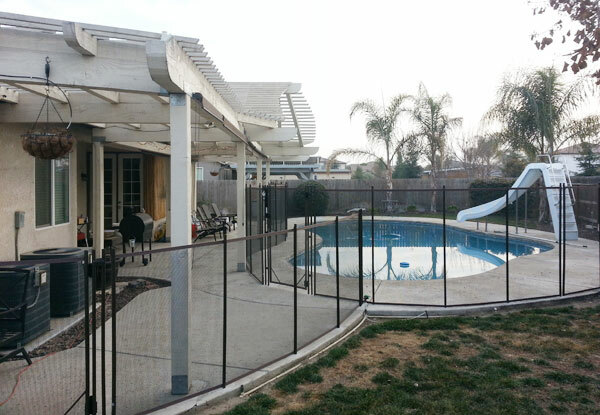 We installed this custom removable pool fence in Fresno, CA. The fence stands 5 feet tall and features our popular black mesh with a brown border. The fence surrounds the pool while still allowing direct access to the pool house. 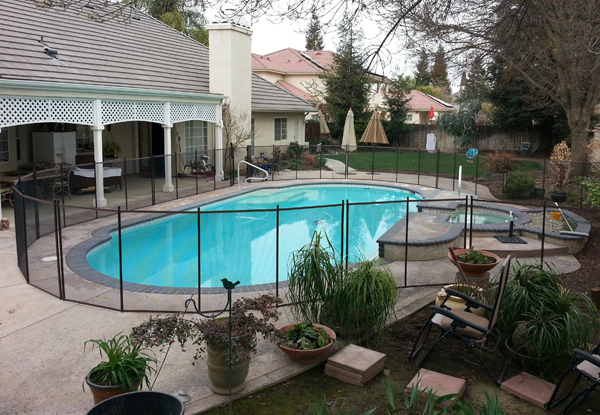 We installed this 4' removable pool fence in Fresno, CA. The fence is made out of our most transparent material, black mesh and features our popular brown trim. This removable pool fence creates a "U" shape around the pool providing a safe barrier to keep small children out of the pool when playing in the yard. 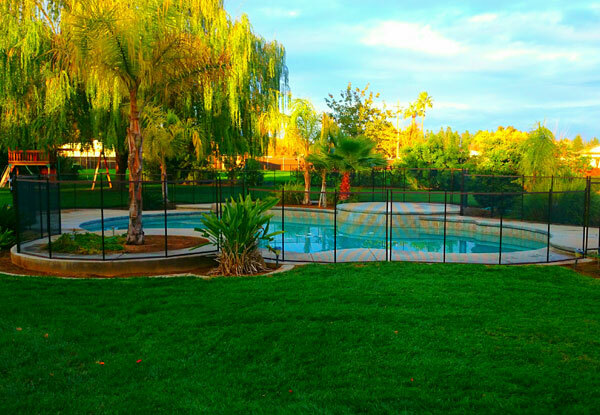 Guardian Pool Fencing installed this 4' black mesh removable fence in the Central Valley. 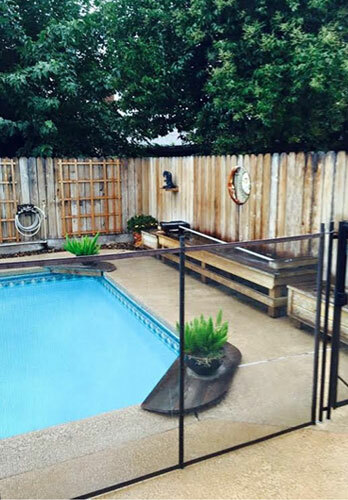 The fence features a brown trim and circles the entire pool. The fence posts were installed into the pavers using a system that insures the pavers don't lift under load. Our customer was very pleased with the results. 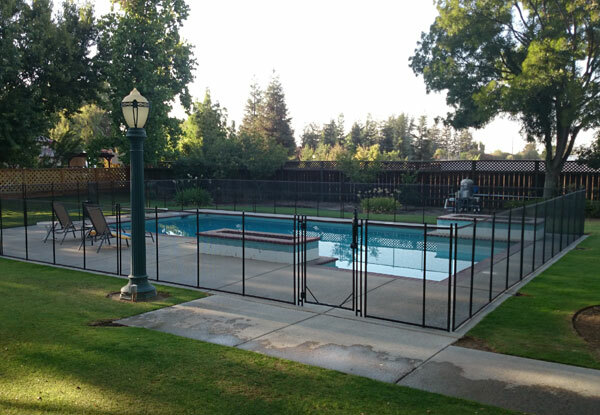 Guardian Pool Fencing installed this removable pool fence in Madera, CA. The black mesh fence features brown poles and stands 5 feet tall. The fence secures the pool area while still allowing the homeowner to walk around the pool on their concrete deck. 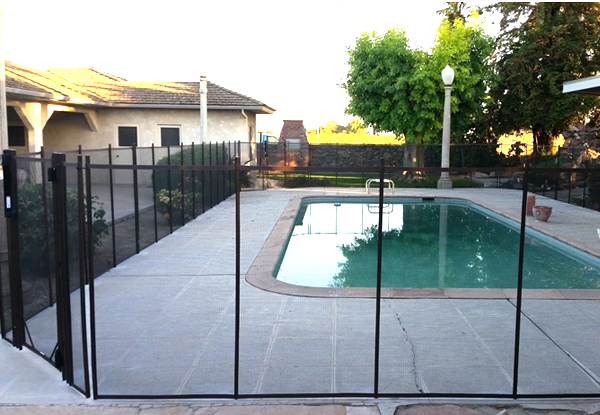 We completed a removable pool fence installation in Visalia, CA. 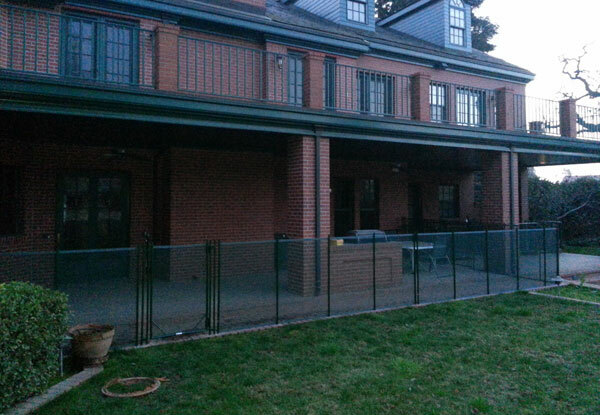 This 4' removable fence with black mesh and brown trim outlined the deck and completely isolated the pool. The client's yard was large and they wanted it open outside of the pool zone. The sun sets on another fence installation by Guardian Pool Fencing. 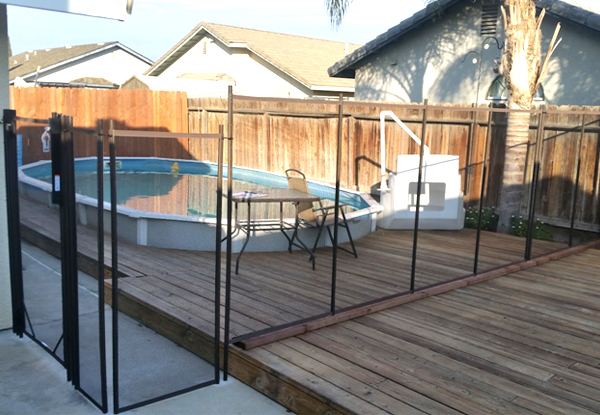 This removable four foot fence in Fresno, CA encloses the pool yet leaves some deck around the perimeter for walking space. 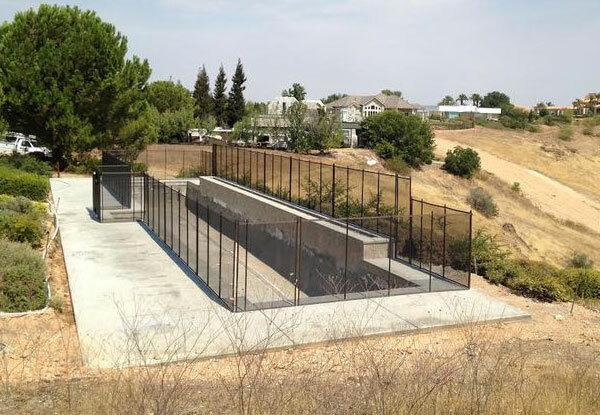 This removable pool fence installation in Atascadero, CA features black mesh and grey poles. The fence circles the pool with plenty of room on the inside and enough on the outside for other activities. 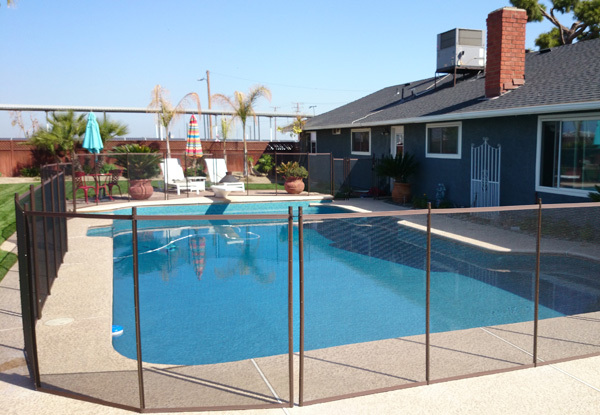 This removable pool fence in Atwater, California, features a 4' Black Mesh (most transparent) and Brown Trim (most popular choice). Notice how nice and tight the installation looks as well as the well-cut, 45 degree angles. 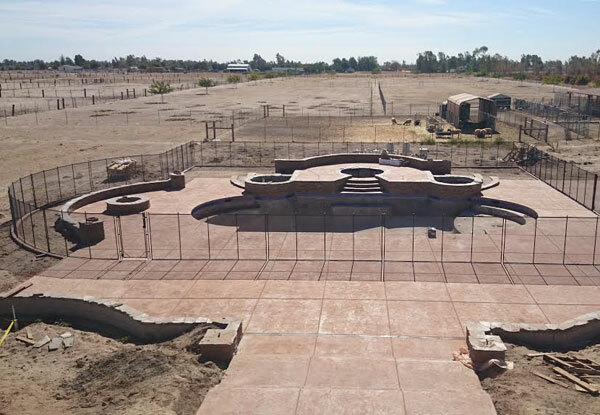 Guardian Pool Fencing installed this 5' Black Mesh with Brown Border pool enclosure in Clovis, CA keeping children safe and secure. Our 5' fence poles are so strong we space them at 36" compared to competitors at 30". 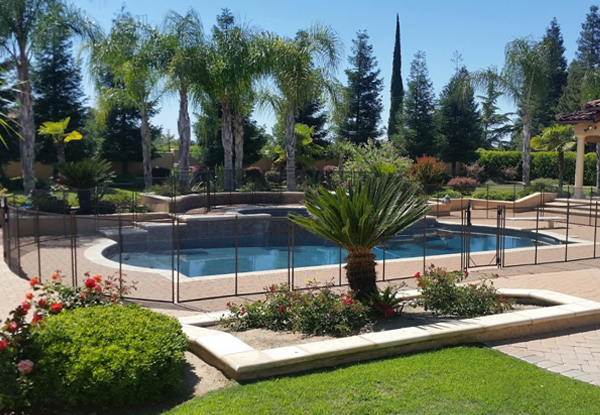 This residential pool fence installation in Clovis, CA consisted of one 4' removable fence with black mesh and brown trim circling the pool and another fence in the same color circling the spa up above the pool. Since the spa wasn't used often they decided to not have a gate at that location. 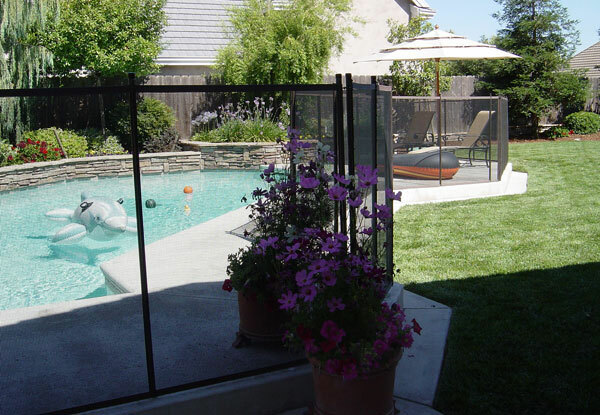 This removable pool fence in San Luis Obispo, California, features a 4' Black Mesh and Brown Trim, and is a popular choice as it offers maximum transparency. For the best results, we added extensive concrete curbing around the concrete slide and spa area; the customer was very pleased. 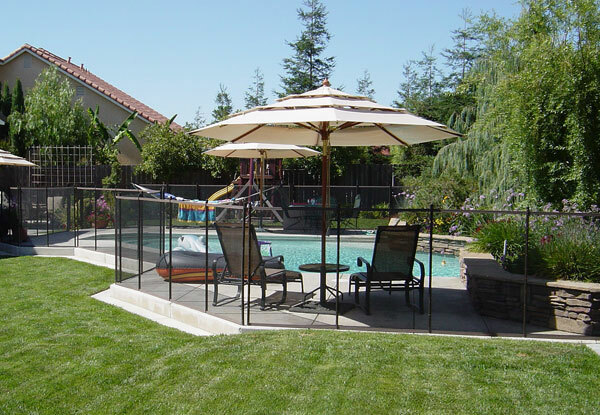 This removable pool fence in Exeter, California features a 4' Black Mesh (which offers the most transparency) and Beige Poles. Notice how the lighter colored poles tend to stand out more. Darker poles tend to blend better with the background colors thus making them less noticeable. This custom-designed, removable pool fence in Atwater, California features a 4' Black Mesh (most transparent) design with Brown Trim (most popular). Notice how sturdy the installation looks as well as the well-cut, 45 degree angles. Here is a close-up of the removable pool fence we custom-designed and installed in Atwater, California. It features a 4' Black Mesh (most transparent) and Brown Trim (most popular). Notice how sturdy the installation looks, as well as the well-cut, 45 degree angles. 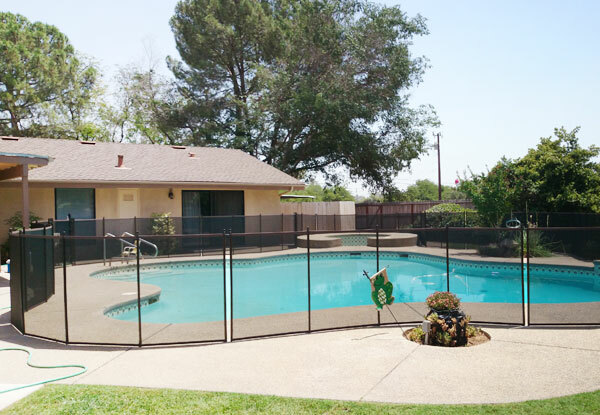 This removable pool fence in Tulare, California, features a 5' Black Mesh (most transparent) with Brown Trim (most popular). This job consisted of two systems; one for the pool (foster care) and a separate 4' Tall Fence one for quick, easy and convenient dog containment. This removable pool fence in Visalia, California features our 4' "All Green" fence, which looks best when used in conjunction with red brick, such as with this red brick patio, as well as when paired with an abundance of green foliage. And, in this case, our "All Green" mesh fence also brings out the home's natural green trim. Here we used a 4' removable mesh fence with Black Mesh and Brown Trim. Overlooking Lake Millerton, this removable pool fence in Friant, California, protected the property's gorgeous view while also protecting the owner's grandkids. The customer was also pleased by how the fence defined the pool space. 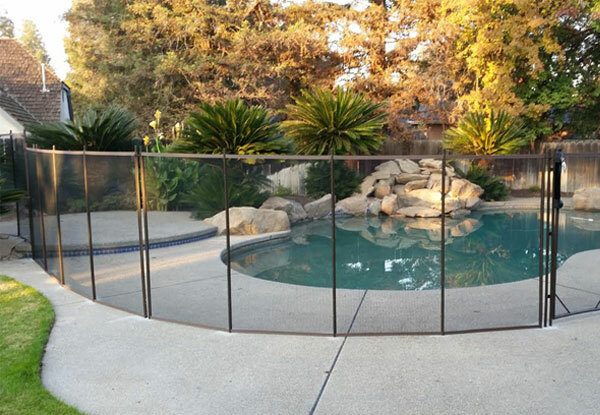 This removable pool fence in Fresno, California features a 4' Black Mesh (most transparent) and Brown Trim (most popular). Notice the curb we constructed to ensure the absence of gaps beneath the poles. 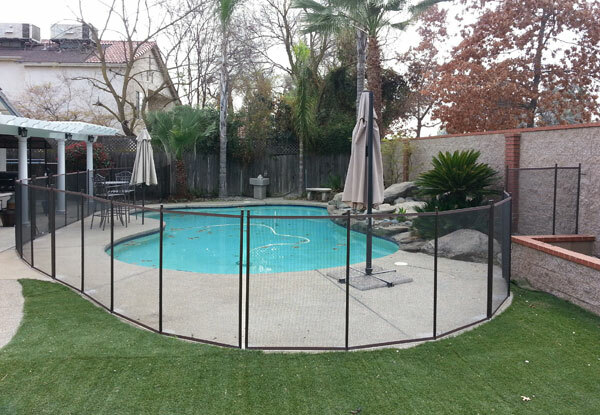 This removable pool fence in Fresno, California features our 5' Pet Mesh with Brown Trim. Notice the quality fence installation on the back steps... no problem for our knowledgeable and trained installers. 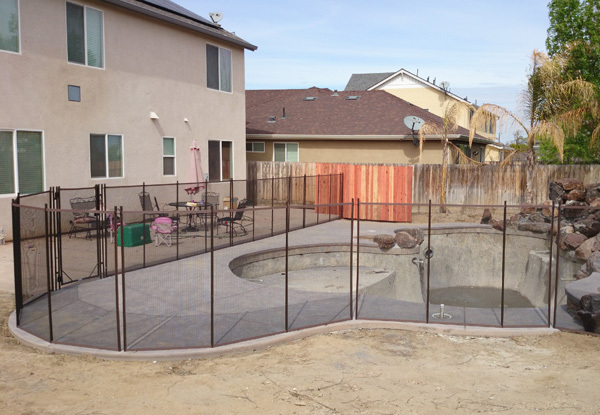 This removable pool fence installation in Central Valley, California, features a durable, 4' Pet Mesh, Brown Trim and a concrete curb along the lawn line to prevent the dog from digging under the fence. 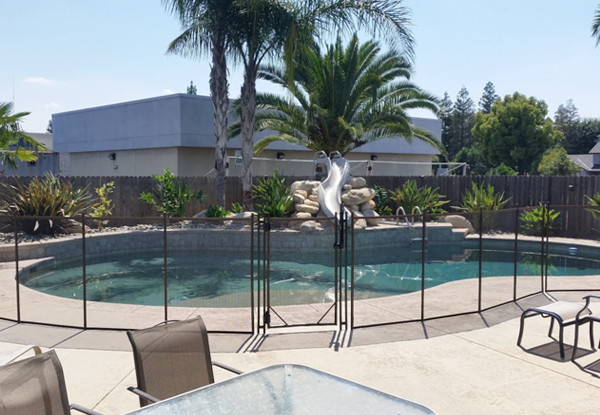 This removable pool fence in Visalia, California features our 4' Black Mesh and Brown Trim. As you can see from the photo, it beautifully isolates the pool while leaving plenty of space for kids to play. In this Central Valley removable pool fence, we installed a step down after the concrete line to ensure minimal gaps and ultimate safety. 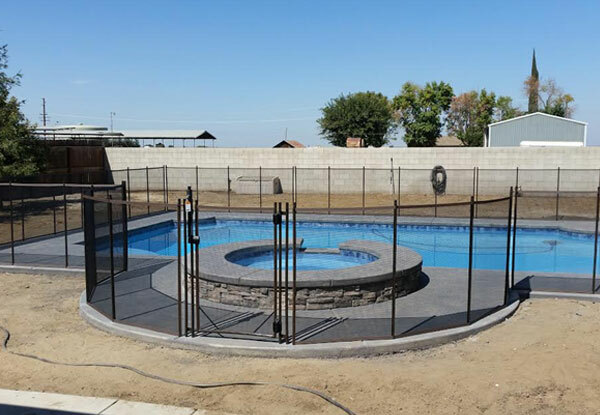 For this removable pool fence installation in Clovis, California, we used 198' of our 4' Tall Pet Mesh, featuring Brown Trim. The customer was very pleased. 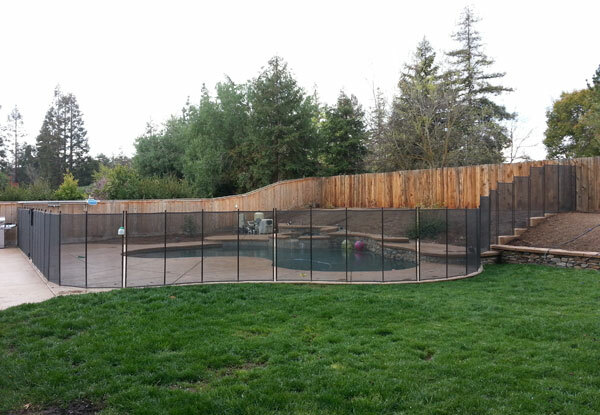 This 4' pet mesh removable fence in Clovis, CA features our popular brown trim option. It circles the homeowner's pool to ensure safety, but also leaves space around the outside of the fencing system to maintain the convenience of a pathway. 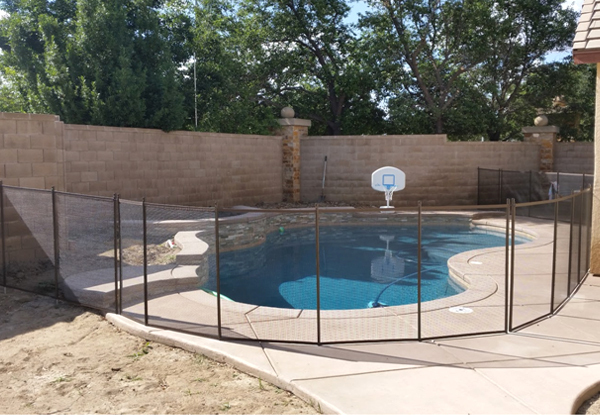 This removable pool fence in Clovis, California features a 4' Black Mesh (most transparent) and Brown Trim (most popular). Notice the transparency of the fence, which is one of the benefits of mesh fencing when compared to wrought iron. 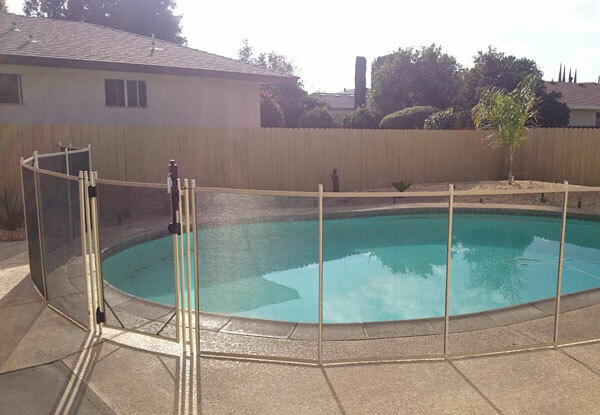 This removable pool fence in Visalia, California was expertly installed on a composite wood deck, and features a 4' Black Mesh (most transparent) and Brown Trim (most popular). Notice how tight and straight the layout is; the customer was very pleased. 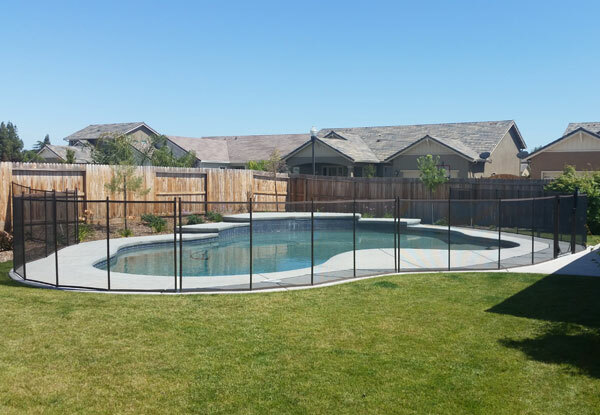 Installed in Clovis, California, this removable pool fence features a 5' Black Mesh with Brown trim, and extends from the back fence around the pool and back to the back fence. Notice how we designed this fence to run along the entire wall in order to keep the kids safe. This removable pool fence in Visalia, California features a 4' Black Mesh (most transparent) with Brown Trim (most popular). 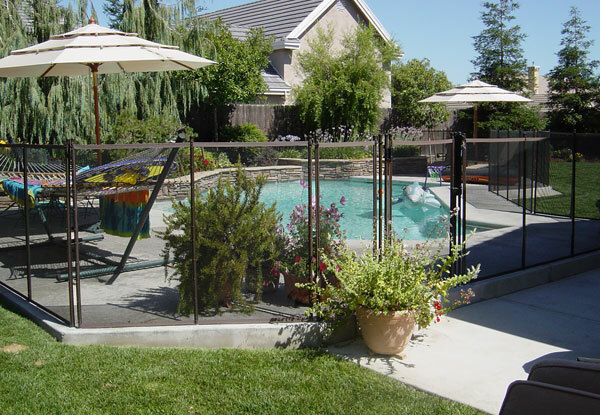 Notice how we were able to custom-design the pool fence to completely enclose the pool area without blocking the space's natural beauty...this transparent-effect is one of the reasons those in the Central Valley prefer our removal pool fences over the rest. 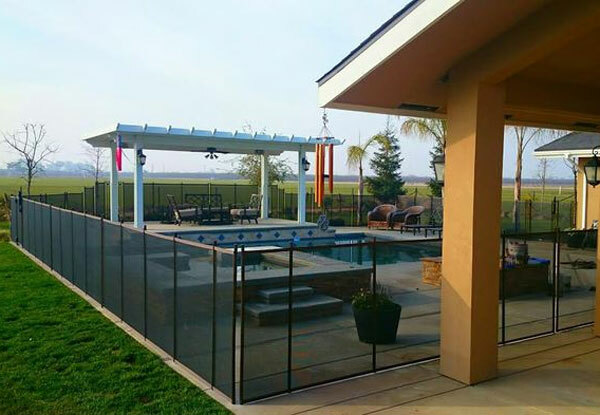 This removable pool fence in Tulare, California features our 4' Black Mesh (most transparent) and Brown Trim (most popular), and went from house around the pool and back to the house with gates at both ends. We left enough room around the fence to allow passage while still on the deck. 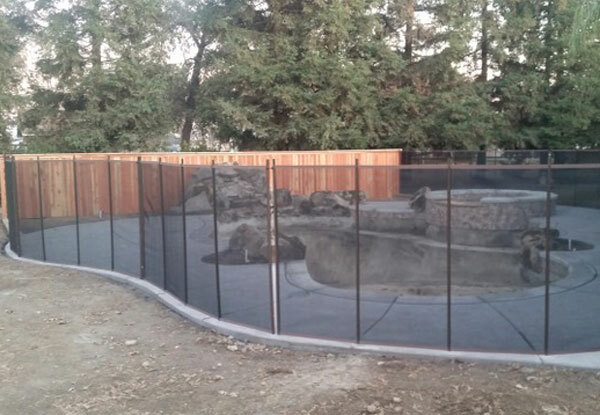 This removable pool fence in Exeter, California features a 5' Removable Pet Mesh. Great for keeping pets and children safe near the pool, this durable Pet Mesh Fence is slightly less transparent than our standard mesh, and is a Guardian exclusive material at 11 x 16 strands per square inch. 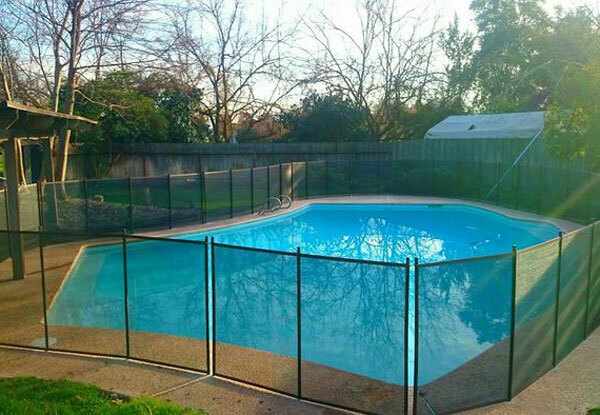 This removable pool fence in Fresno, California features 4' Black Mesh (most transparent) with Brown Trim (most popular). This pool fence was also custom-designed to isolate the pool area while leaving the yard open for the kids to play. 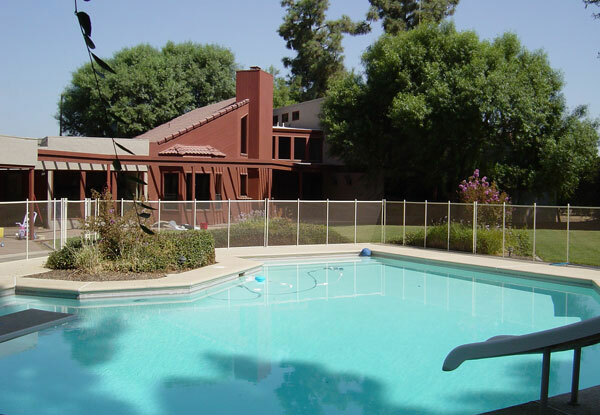 This removable pool fence in Fresno, California features a 4' Black Mesh (most transparent) with Brown Trim (most popular). Notice how clean the 45 degree angles look. The customer liked how the pool fence line defined the pool space in his open yard. 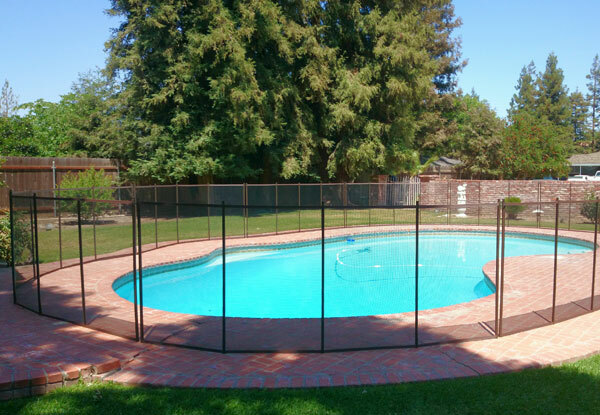 This removable pool fence in Fresno, California features 4' Pet Mesh and Brown Trim. While slightly less transparent, this pet mesh fence is the perfect choice for owners with strong dogs that might claw on the fence. This mesh is a Guardian exclusive material that is unmatched in the industry. This code compliant 5' tall removable fence with black mesh and brown trim was installed in Madera. It circles the entire pool area and has added curbs on the left and back side. The transparent black mesh, exclusive to our company, maximizes see-through quality and strength. It's also easily removable for occasions when children are not present. This removable pool fence in Fresno, California features 4' Black Mesh with Brown Trim and was installed into pavers on the sand using a technique that ensures solid footing and no rocking. 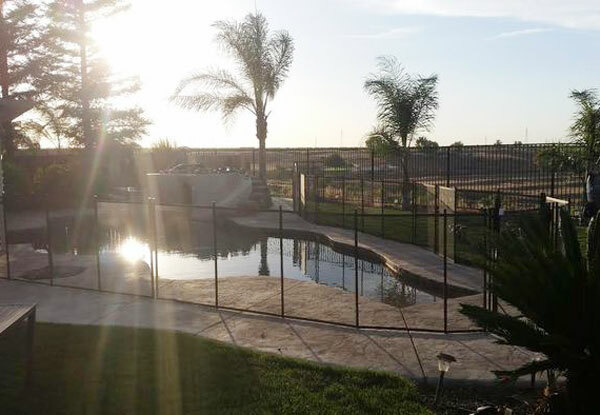 This 5' Tall Black Mesh removable fence in Clovis, CA blended well with the landscape and made this client's backyard pool safer. The brown trim complements the property well. 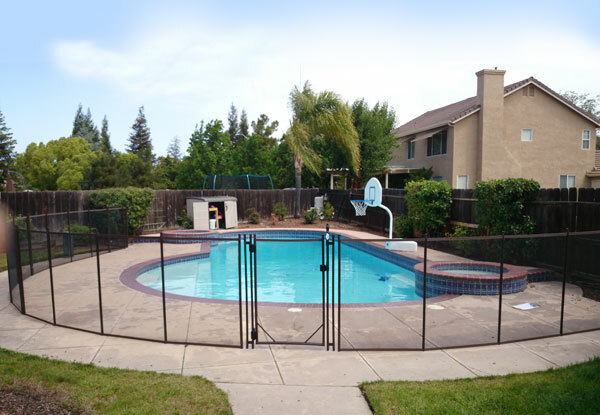 This 4' black mesh brown trim removable fence installation in Fresno circled the pool and nicely defined the space as well as will keep the grandparent calm when the grandkids visit. This 4' all Black Pet Mesh Removable Fence in Clovis went from the back fence around the pool and back to the back fence. Notice the transparency... still good even with the Pet Mesh. 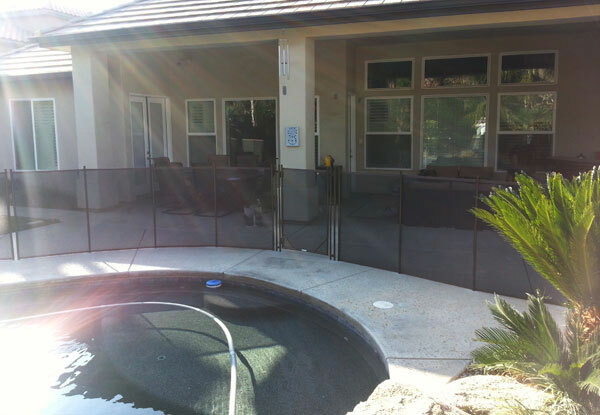 This 4' all Black Pet Mesh Removable Fence in Clovis created a complete enclosure around the pool to the back fence. Even with the black Pet Mesh installed, the transparency is noticeable and the removable fence is still visually appealing, providing a practical and attractive addition to this home. This 4' Black Mesh with Beige Trim removable fence we installed at a home in Fresno, CA is simple, effective, and coordinates nicely with the beige wall behind it. These grandparents wanted the fence just 2' from the water to allow more room on the outside of the fence for their grandchildren to play. 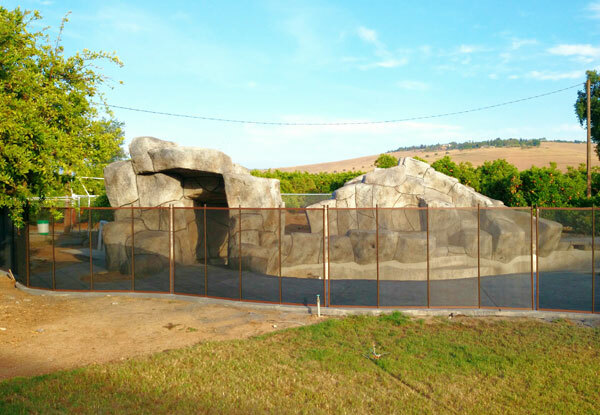 We installed this 4' tall Pet Mesh Fence in Fresno County. The fence was large enough to circle the pool and all outdoor furnishings, creating a fully enclosed backyard area. 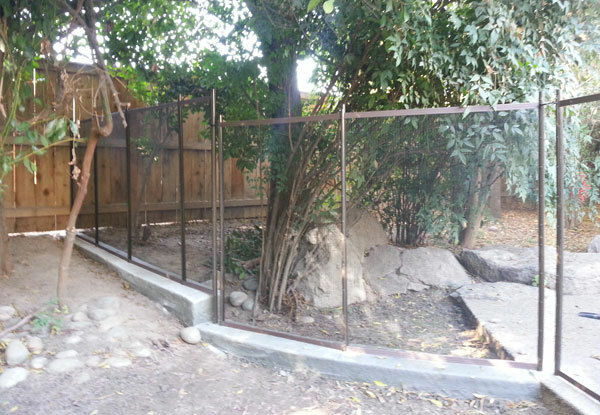 This 4' tall Pet Mesh removable fence with brown trim was recently installed in Visalia, CA. The fence frames the pool nicely and the customers are happy their children will be safe. This 4' removable fence with black mesh and brown trim in Clovis circled the pool as it was in the center of a large yard. Lots of turns and steps and turned out beautiful and most importantly made it safe for their child along with nieces and nephews. 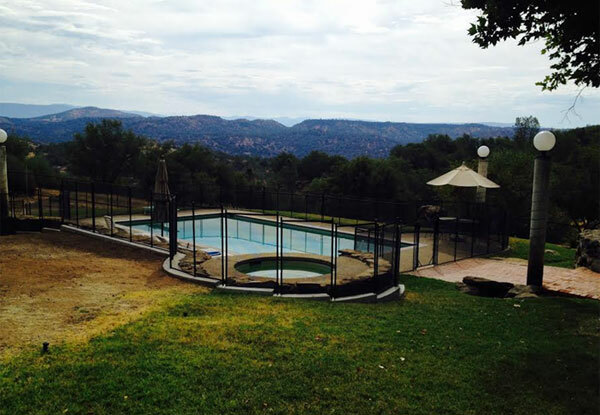 This 4' removable black mesh fence with gray poles in Paso Robles, CA circled our client's pool. We left significant space around the pool as requested by the customer who wanted a yard outside the fencing system for maintenance, dogs, kids, etc. We installed a 4' removable fence in Clovis, CA. This black mesh removable fence with brown trim was installed to isolate the pool from the back fence to the side fence. 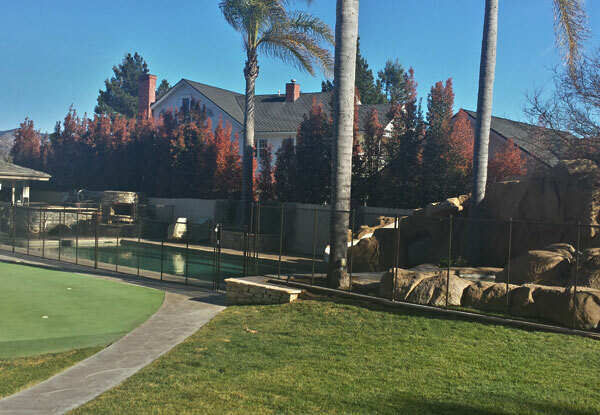 This 4' removable fence in O'Neals, CA circled the pool and required extensive curbing around the spa to complete the installation. It turned out quite nice. This 4' tall removable fence in Fresno, CA is complete with black mesh (our most transparent) and brown trim (our most popular). The fence circles the pool and goes up and down steps per the client's wishes. This layout allows total access to the yard without having to go through the fence for non pool activities. 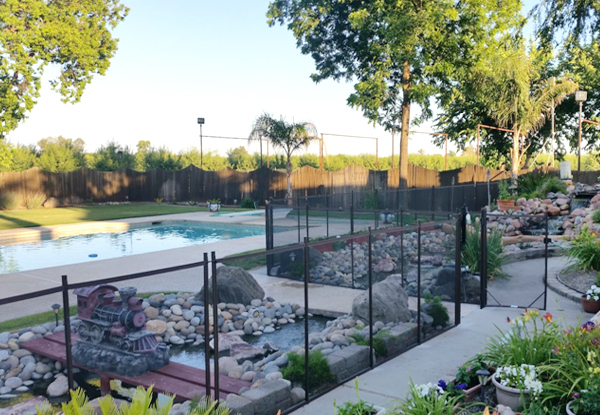 For this removable pool fence in Tulare, California, we installed a 4' Removable Black Mesh with Brown Trim, making sure it extending from one back wall to the other. Notice the concrete curbing on the left side to ensure no gaps under the fence line as it traveled through the dirt. The customer was very happy. This removable pool fence installation in Exeter, California, features a 5' tall Black Mesh (most transparent) with Brown Trim (most popular) and required circling the pool as the yard was open all around. 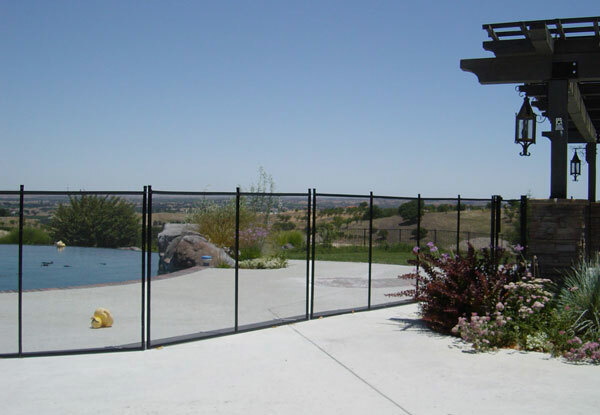 This removable pool fence installation in Paso Robles, California features a 4' All Black Mesh. All Black Mesh tends to look bold and is the right color when black furniture or other black accessories are present. We installed a 5' tall removable fence at this home in Clovis, CA. The fence included a multi-step section, as displayed here. We also poured the curbs to ensure the homeowner's dog would not be able to dig under the fence. 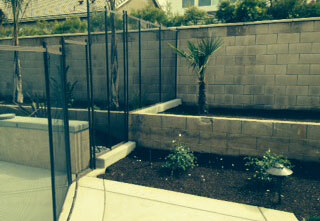 Guardian Pool Fencing installed this black mesh and brown trim pool fence in Clovis, CA around a client's spa. This residential pool fence installation matches our client's pool fence of the same color. 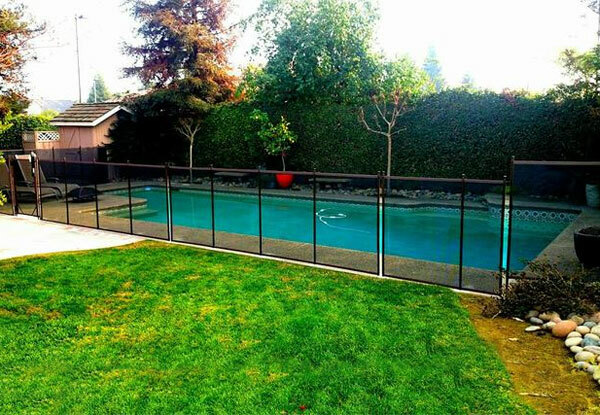 This 4 1/2' tall pool fence in California's Central Valley features Black Mesh and Brown Trim (most popular). We custom-designed and installed this removable pool fence to circle the pool and allow full access around the outside. Because of the brick step-up, we were careful to design the removable fence with added clearance at the bottom so it could open over the step. 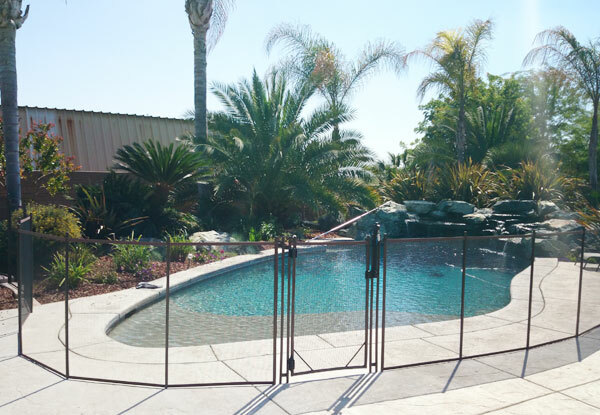 For this Central Valley removable pool fence, we helped husband and wife compromise on a custom-design and layout. After much debate, and numerous consultations, we installed this 4' Mesh Pool Fence. The dynamics between couples can be unpredictable, but we always do our best to communicately openly with our customers and achieve the best results possible. 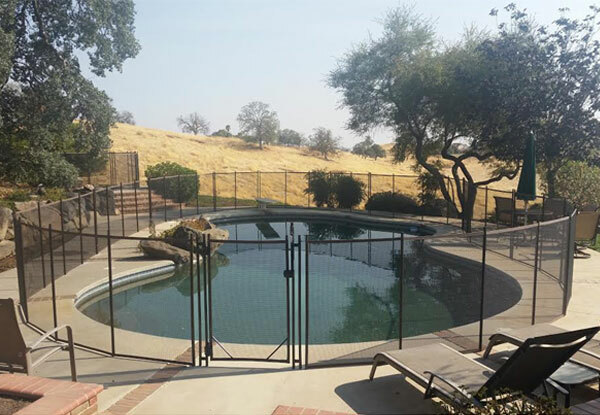 This removable pool fence in Kingsburg, California features a 5' Black Mesh with Brown Trim and was expertly installed from the side fence to the back fence. Guardian's fence poles are so strong we now use 36' spacing between poles, resulting in less holes and less poles on your property. 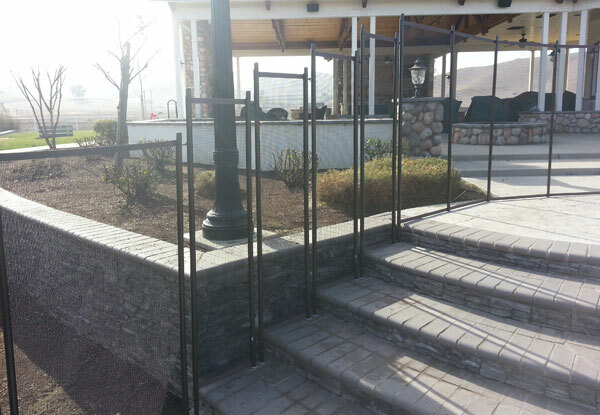 For this removable pool fence was installed at a Central Valley, California home and designed with steps (or peg legs) to avoid drilling near the edge of the upper step. Notice how all the poles are nice and vertical without any bowing; this is another quality pool fence installation for sure. 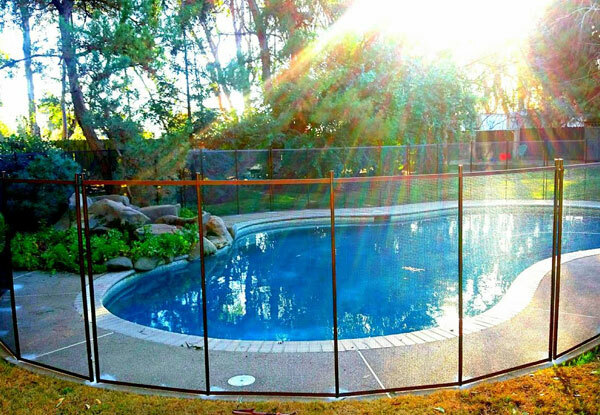 Here is a removable pool fence we installed in Clovis, California. Featuring 5' Brown Mesh (less transparent than black mesh as it reflects more light and becomes somewhat glary) and Brown Trim (most popular), this removable pool fence required circling the pool as the customer wanted access around the backside for the kids to play and the dog to have free reign. 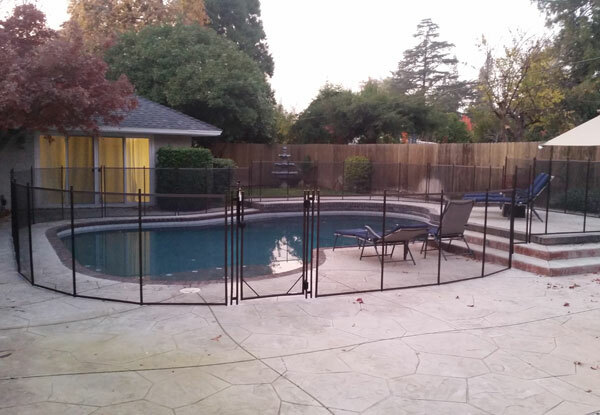 Here is a removable pool fence we installed in Visalia, California. Using our 5' Black Mesh (most transparent) and Brown Trim (most popular), this fence was installed to meet code so the customer could finish his pool. Central Valley pool owners can trust that our fencing system is certified to meet the CA State Building Code and carries one signifying label on one pole per section. 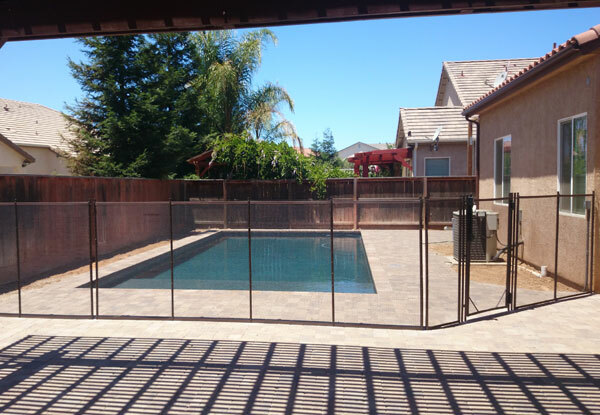 This removable pool fence in Fresno, California features our 4' Black Mesh with Brown Trim; it completely surrounds the pool while allowing free access around the outside of the fencing system. Attractive and functional, the customer was very happy with the results. 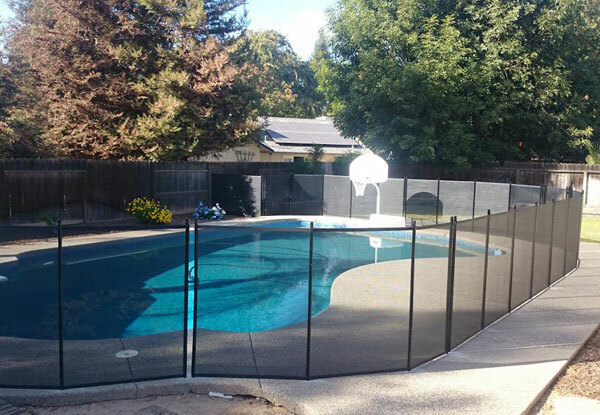 This removable pool fence in Visalia, California features 4' Black Mesh and Brown Trim, and was installed to partition the pool from the backyard in a pie shaped lot. Notice the concrete curb cutting through the lawn to ensure a solid installation. This 4' black mesh with brown trim removable pool fence in Clovis circled the pool to allow access all around outside of the fence. Notice how we did the steps... no problem for a Guardian Installer. 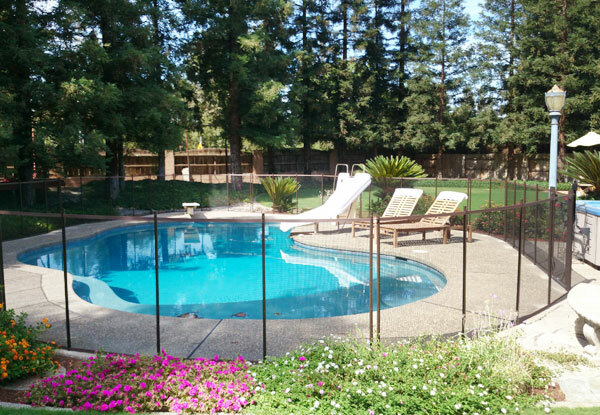 Using 4' Black Mesh with Brown Trim, this removable pool fence in Sanger, California circled the entire pool. Notice the uniformity of the step-ups. Also, notice how transparent the system looks. 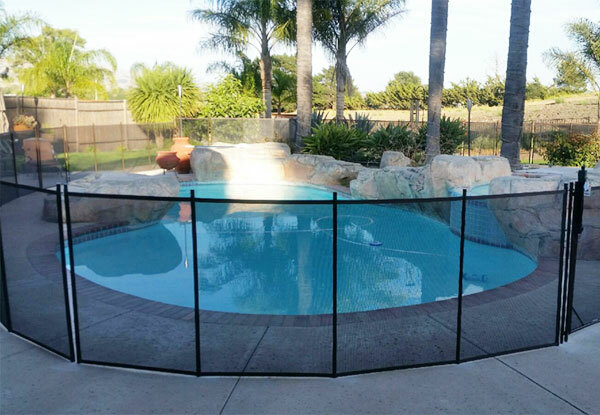 This removable pool fence was installed in the Central Valley using a 4' Black Mesh (most transparent) and Brown Trim (most popular). We worked from the back fence to the side fence to protect the client's grandkids. In this case, we followed the existing curbing to make it feel more spacious on the poolside of the fencing system. 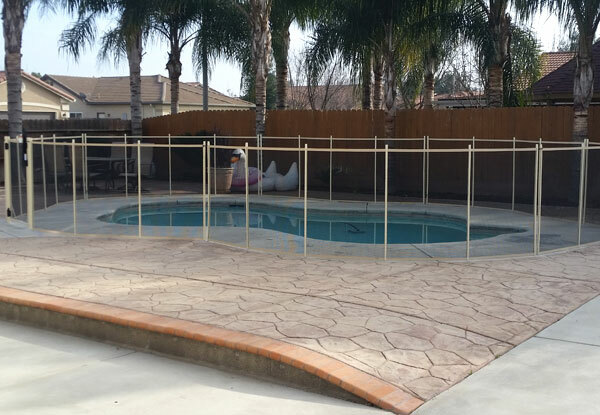 This removable pool fence installation in Fresno, California features a 4' Black Mesh (most transparent) with Brown Trim (most popular). Installed by our in-house experts, this pool fence required circling the pool as the customer wanted access around the backside for the kids to play and the dog to have free reign. 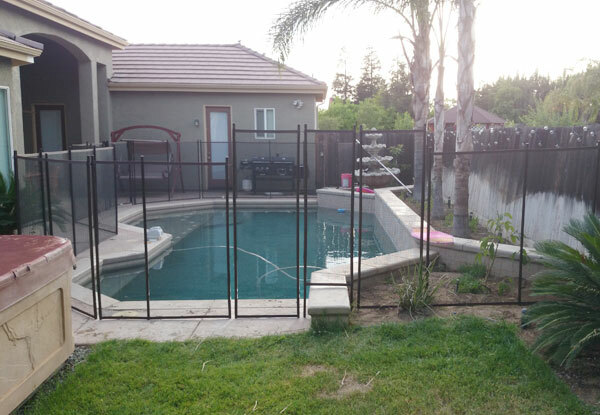 Here is a removable pool fence we installed in Fresno, California. Featuring 4' Black Mesh (most transparent) and Brown Trim (most popular), this removable pool fence went from the back fence to the side fence as free access around pool was not necessary and this kept the cost down. Note the curb we poured on the back side to keep their dog from digging under the fence. 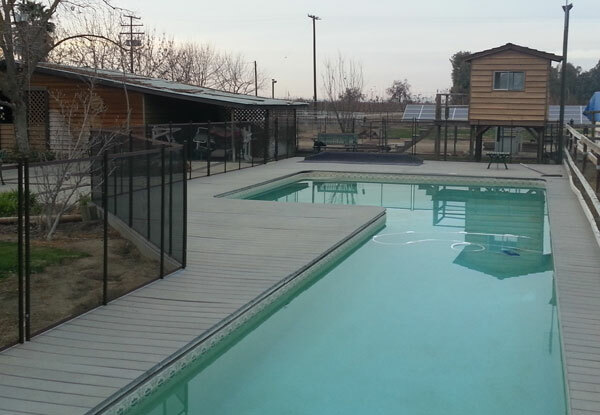 Here is a removable pool fence we installed in Lemoore, California. Using 4' Black Mesh and Brown Trim, this removable pool fence required a 95' curb (which we perform in-house) to surround the back side of the waterfall and landscaping area. Completed in one day, this 216' pool fence exceeded the customer's expectations as it looked great and created a safe space for kids to play. This 4' all black removable fence installation in Paso Robles was configured in a "U" shape to keep small dogs and grandchildren safe in the pool yard. The ends were specially tapered to line up with the wall for a clean, customized touch. 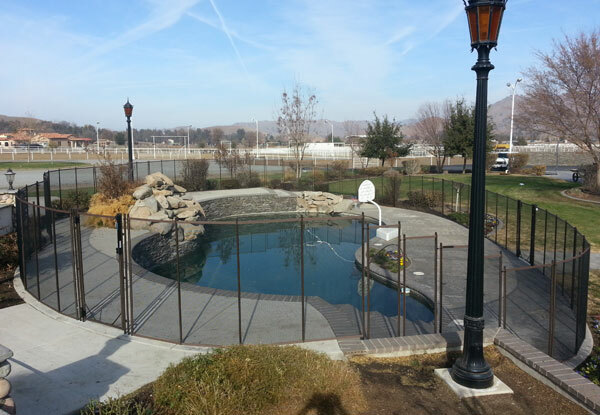 Guardian Pool Fencing installed this 4 ft. tall, black removable fence system for a Lemoore recreation center. The client needed a way to section off different areas of their large open space. It was constructed from durable "pet mesh," with the flexibility to be reconfigured or removed. 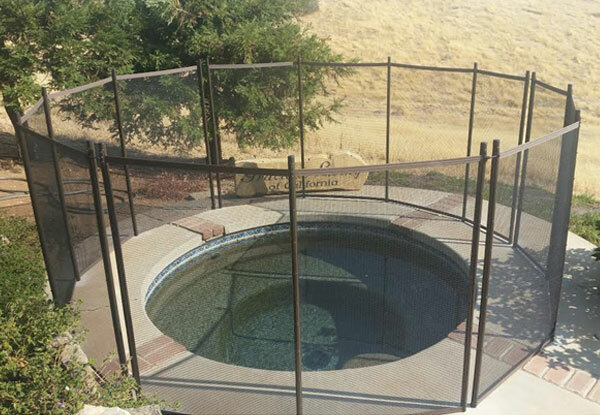 Using 4' Pet Mesh with Brown Trim, this removable pool fence in Central Valley, California, had to pass through the dirt on both sides. Notice how tight and straight. We can customize the height of our removable fencing. 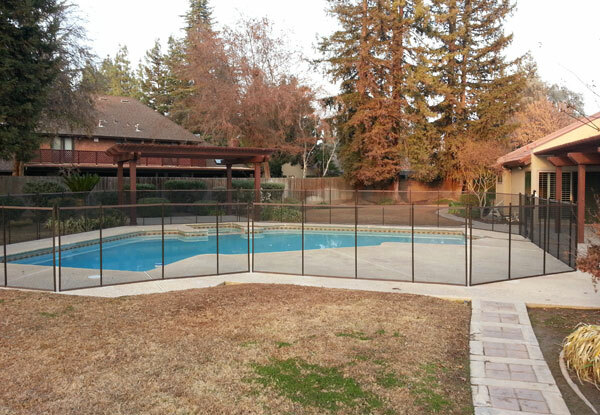 This removable pool fence in Fresno was a 2' tall (custom height) Pet Mesh removable fence with brown trim. It hugs the perimeter of the pool tightly since the customer doesn't use the pool much and wanted to keep their senior dog safe. When entertaining, they can remove as much of the fence as they'd like. In this case, no gate was necessary. 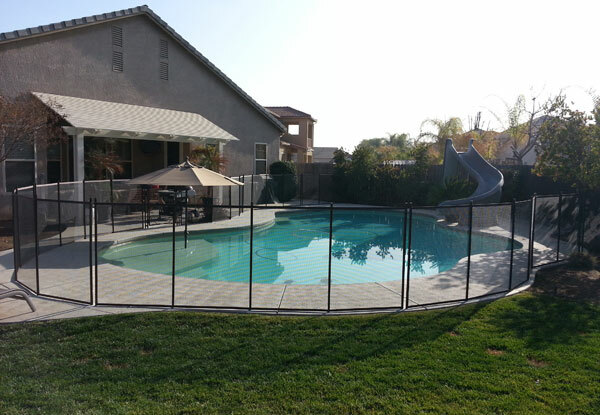 Guardian Pool fencing installed this 4' removable fence with black mesh and brown trim in Clovis, CA. The pool fence is nearly 10 years old and still standing proud doing its job of protecting our clients' small dogs. Notice how tight the fence still looks-- that's what a certified installer can do with a premium grade product. 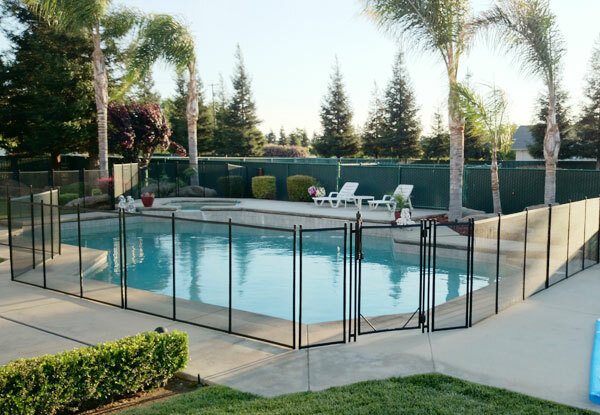 This removable pool fence in Atwater, California features our durable, 5' Pet Mesh (a Guardian exclusive, claw-resistant material) and Brown Trim (our most popular option). Notice the reduction in transparency with this mesh. On a scale of 10 for transparency I would estimate the Pet Mesh to be about a 7 or 8. In spite of this reduction, it is the material of choice if you have a strong pet that might claw at the mesh. At roughly 15% of my business, it has proven to be a good solution when strong pets (such as Labs, like mine) are involved.